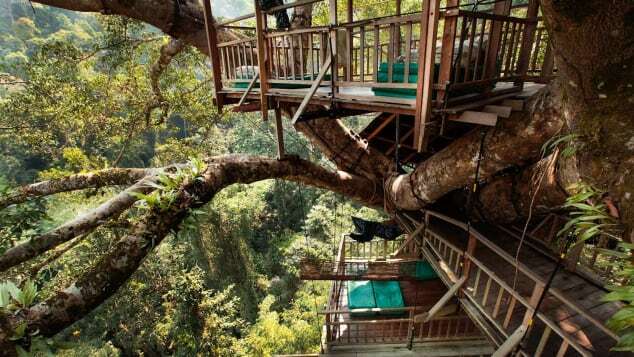 The Gibbon Experience treehouses are 30-40 meters above ground. It's the stuff of childhood dreams. As the sun begins to break through the darkness in Laos' Nam Kan National Park, the cries of wild, black-crested gibbons echo through the jungle air. It's an incredibly special moment you won't find anywhere else in the world made possible by the Gibbon Experience, a tourism-based conservation project that kicked off in the late 1990s as a response to illegal logging. 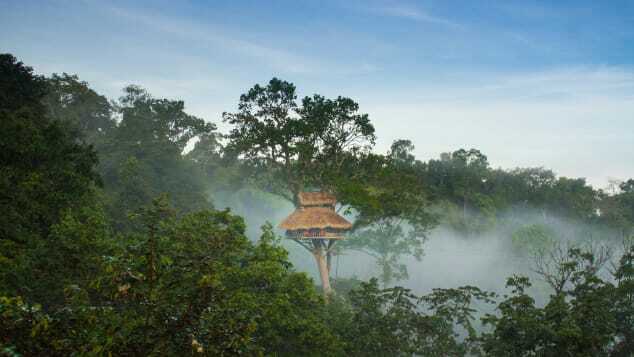 At a height of 30-40 meters above ground, the Gibbon Experience's eight treehouses are the tallest in the world, according to staff. But here's the best part (or worst, if you're not a fan of high-speed thrills). The only way to access them is via zipline. "We have a 15-kilometer network of ziplines," explains Yann Gourmelon, the Gibbon Experience's GIS specialist. "It allows us to bring customers deep into the forest very, very quickly. The longest line is 600 or so meters, which means you'll be zipping along superfast for about 50 seconds enjoying the views." The Classic Tour and Waterfall Tour are both three days and two nights. There's also a two-day, one-night Express Tour. We picked the Classic Tour -- it's the most relaxed option -- given we had three kids under 12 and one teenager in our group. 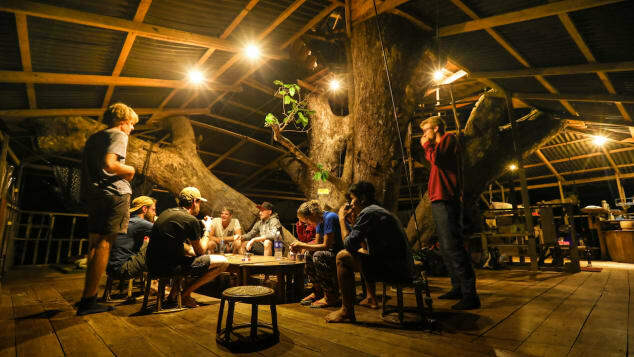 All eight treehouses are equipped with electric lights. Day two was spent much in the same way -- trekking through stunning jungle scenery and enjoying exhilarating (and at times terrifying) zipline routes, while also visiting other treehouses in the Gibbon Experience network. Laos-style meals are cooked up in a neighboring village and delivered to the treehouses by staff -- via zipline, of course -- along with fresh local fruits and local snacks. Gourmelon says considerations include location, height and whether there are gibbons nearby. Too high and it's difficult to supply fresh water. Too low means visitors would miss out on the views. "About two years ago we changed the way we design treehouses," he explains. "Before we had to bring an architect to spend a lot of time in the tree. It's not very comfy and not easy if you want to take accurate measurements of the angles and curves everywhere. It wasn't very efficient. You could make beautiful treehouses, but it took a lot of time." Travelers sleep in the open air. Mattresses are covered in mosquito nets at night. Through the use of photogrammetry software, they're then able to generate a 3D model of the tree, which is used to work on the design of the actual treehouse. 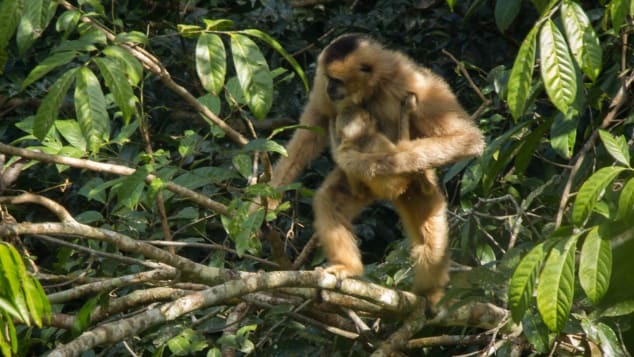 The Gibbon Experience was born of a desire to conserve the area's valuable ecosystem and protect it from pressures like Illegal logging, commercial cropping and excessive slash-and-burn practices. Black-crested gibbons are a critically endangered species. "But how are you going to find funds to protect the area, because you need to pay forest rangers, and the government at this time didn't have a lot of money," says Gourmelon. Then came the idea to create a series of trails, treehouses and zipline networks -- "the visible part of the iceberg," he says -- as a way to bring people and money to the forest. Travelers should pack lightly, as they'll need to carry their backpacks with them on the first and final day of the trek. 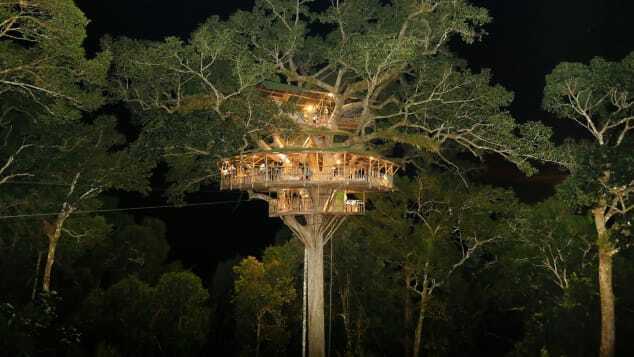 A Gibbon Experience treehouse at night. Zipline safety: Since beginning zipline operations in 2004, there's been one fatality. Guides are strict about making sure the line is clear before the next person uses it by sending signals across the cable, though do take care to make sure you're using your own equipment correctly and all knots are secure as you won't always be in the presence of a guide.